Welcome to the beautiful city of Mary Esther, Florida! Here in Okaloosa County, we are known for our gorgeous white sandy beaches and our dark blue water. The coastline scenery of this area is one that simply cannot be beat. Aside from the visual attractions, I’m sure you will also enjoy some locally fun activities! Gulfarium Marine Adventure Park is an amusement park with sea life shows and first hand dolphin entertainment! Another really cool spot is Cattywampus Aquatic Adventures, a boat tour company that shows you some of the coolest sights and nature you’ll ever witness! The fun isn’t the only good thing around here, our food is out of this world. A meal at Ali Baba Grill Cafe is one not to be skipped, here they are a 4 star restaurant specializing in Turkish and Greek food. Another great food place is Benjarong Thai Cuisine, a Chinese place with a variety of tasty eats. Overall the area seems pretty awesome right Well booking with Emerald Coast by Owner makes it even better. We provide you with a luxurious vacation home or condo, a convenient location to take advantage of all the local spots, and it’s easy for you to choose where and when you stay! 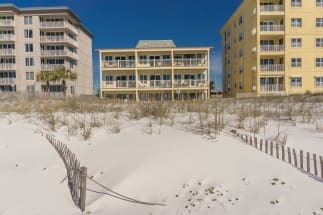 Emerald Coast by Owner is pleased to bring you the best Vacation Rental Properties by Owner in Mary Esther! Be sure to contact us with questions and book online today!